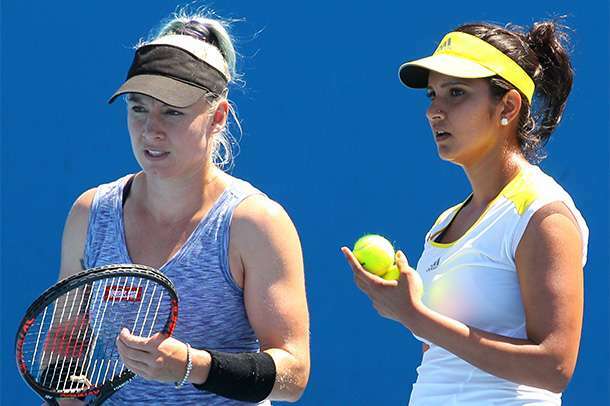 Currnetly the top-ranked player in the women’s doubles for the second year in a row, Indian ace Sania Mirza could lose that ranking to current Brisbane partner Bethanie Mattek-Sands if the pair win the tournament. Mirza has been World No. 1 since 2015, but due to the defense-of-points system, could stand to lose her title in Brisbane to Mattek-Sands if the pair win the title. This is not the first pair have won titles together in the past, but split up, following which Mirza experienced the most successful part of her career with former singles No. 1 Martina Hingis. The pair won titles in Brisbane, Sydney and the Australian Open and followed that up with more Grand Slams and titles, but announced a surprise split in August 2016, following which Mirza paired with Czech Barbora Strycova. Now, after a successful 2016 season, Mirza has come together with Mattek-Sands at Brisbane, where the pair have had success before. However, given Mirza’s immense success with Barbora Strycova, as well as Mattek-Sands’ fruitful, title-winning partnership with Lucie Safarova, it seems unlikely the two players will split up with their respective partners, making this a one-off partnership. Bethanie Mattek-Sands is only 330 points behind Mirza on the rankings. Having won the title last year, Mirza is defending more points than Mattek-Sands; the cyclical nature of points means that Mirza’s winning points from last year will be subtracted – although she will keep her current total should she win, but Mattek-Sands, who did not win last year, stands to gain points from the win. That gain in points will in this case exceed the 330-point deficit she has to Mirza, giving her the No. 1 spot. Sania Mirza has been in the form of her life, but so has Bethanie Mattek-Sands – the two are among the most all-round players in the game. Martina Hingis, too, is close on her former partner Mirza’s heels and has partnered up with the in-form American CoCo Vandeweghe, who has currently been playing some good tennis at the Hopman Cup. What the cyclical system of points will do is mix up the doubles field somewhat; this is already happening with the singles, with every one of the WTA Top 5 having seen early finishes at their respective tournaments in Brisbane, Shenzhen and Auckland. Should she come back with Strycova, who has had a bit of a struggle in the singles – losing in straight sets to an unseeded player at the ASB Classic in Auckland, Mirza will have to step on the gas and continue her immense form from last year. The palpable playing chemistry between Strycova and Mirza will come in handy for the new season. For tomorrow, Mirza and Mattek-Sands will play Ekaterina Makarova and Elena Vesnina in the finals at Brisbane. This signals good things for women’s tennis. Fans have seen the singles field begin to open up as former top players return to form, while a few of the current top players have begun to struggle with consistency. Once the top field opens up, younger or lower-ranked players will have the opportunity to come to the fore – as we have seen currently in Brisbane with Elina Svitolina, Madison Brengle and others who have been consistent in the season but overshadowed in the rankings. Indian fans could now see Mirza, who has taken to social media to discuss her fitness and preparations, could even improve on her already strong, aggressive game, which means even better tennis to watch this season. A change in the rankings could see more aggressive, fighting tennis in the future – and it is a definitive good sign of things to come.